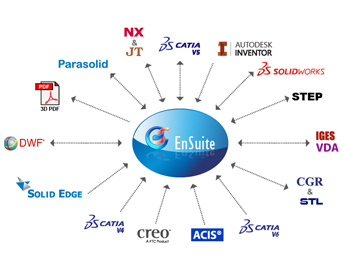 EnSuite provides seamless CAD data interoperability between all major CAD systems in use today. Files can be translated from and to most of the commonly used files formats without the CAD software or license, shaving the cost of MCAD software ownership from the interoperability process. A number of kernel-based and neutral file translators are also available.